I didn’t mean to take a rest day on Monday, since I was scheduled to do 45 minutes, but finishing off the first season of “Game of Thrones” somehow usurped my running plans. So, instead, I went out for the first time this week on Tuesday. I got a late start, and I didn’t think I could do 45 minutes before it got dark, so I decided to skip ahead to the next workout on my training plan: 2 miles easy. I ran the first mile without walking, but ran it much too fast in 10:56. I need to learn to slow down! So I ran/walked the second mile, coming in at an average pace of 12:29. The next day I decided to do the next workout, the same speed interval workout I did last week. But look how much faster I was! 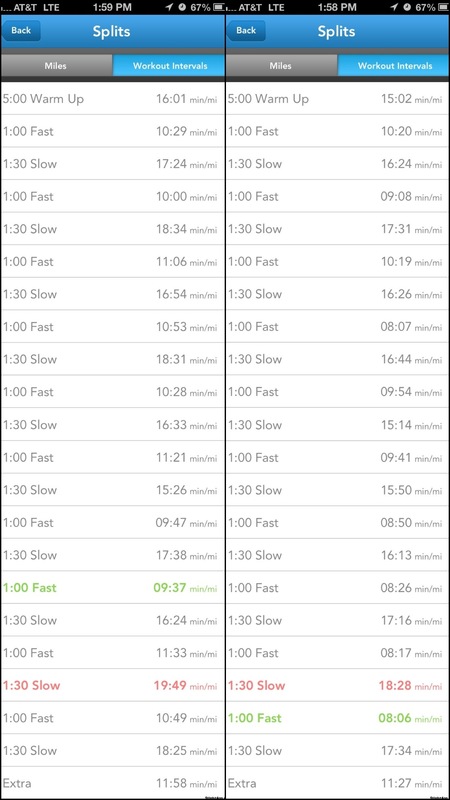 Compare last week’s intervals on the left with this week’s on the right. With the exception of two walking intervals, I was faster on all of the running and walking sections. Speedy speedster! This was on a different route. The one from last week was very flat. This week’s had a couple of hills, which I think makes it even more impressive that I was able to maintain speed uphill, since that’s something I struggle with. Did I mention it was 85 and humid and I had forgotten my water bottle at home? I really have no idea how I managed a sub-9 min/mile pace for a full minute without water, not once but five times. Maybe last month’s hydration routine worked. Next week’s intervals have me doing 13 of them with only 1 minute walk breaks instead of 1:30, so we will see if I can stay as speedy! I finally got in the 45 minute workout I was supposed to do on Monday over the weekend. Well, it actually turned into an hour workout. I really wish I would have looked at the weather a little more closely before I headed out. Because it was HOT. I meant to get out sooner (when it was cooler), but I had a late night out (Titans game and then Broadway Brewhouse, so I didn’t get home till nearly 1 am) so there was no way I was getting up at 6 or 7. Anyway, my plan was to do a 50 minute out and back on the greenway, with a focus on hill training. That all flew out the window once I actually got out there and started running. I tried running up the first big hill but had to walk halfway up it. It was just too hot. My body was using all its energy to try to keep me cool and had nothing left for running. By 1.5 miles in, I was almost out of water, so I altered my route to go by a water fountain. This is what extended the time. The route to the water fountain is also a lot hillier than the route I had planned to take. So, really, the day’s run was more of a walk with some runs on the downhills. Honestly, on the uphills, even walking was difficult. I’m pretty sure I ended up overhydrating because my body was releasing so much salt that the water I was taking in couldn’t get absorbed. Would have been a great day for some Gatorade, but all I had was water. Lesson learned: when the heat index is over 90 degrees, don’t plan to do a long run. And especially don’t plan to do it well. 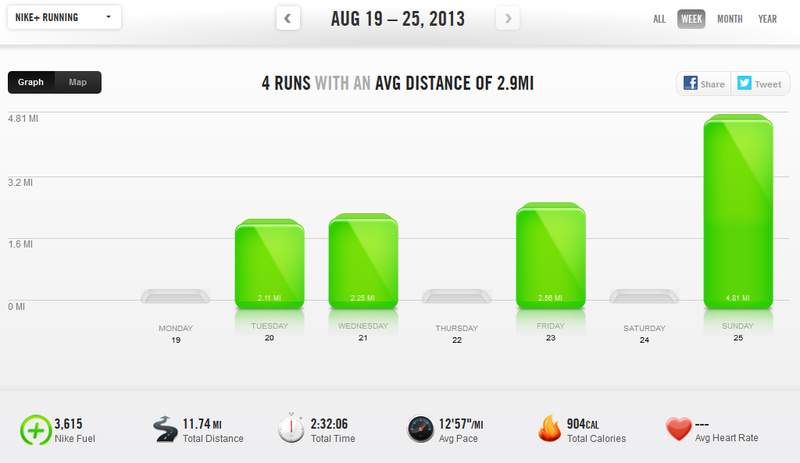 Only three more weeks till half marathon training starts! This entry was posted in Weekly Update and tagged running with friends. Bookmark the permalink.